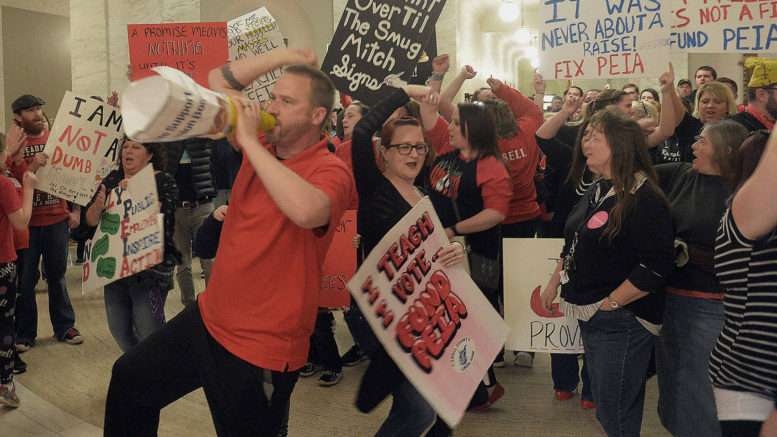 Hundreds of rank-and-file teachers rallied at the West Virginia State Capitol denouncing the deal cut by the Governor and the state's teacher union leaders last night. It appears that the West Virginia teachers’ strike will last indefinitely as rank and file teachers in a majority of counties around the state have promised to continue their strike until the state legislature addresses their concerns. Teachers’ union officials told Payday that they believe that wildcat strikes will take place in all 55 counties tomorrow. The State Superintendent confirmed that schools will remain closed Thursday in all of West Virginia counties due to the strike votes taken by various regions and the high rate of call-outs by teachers upset about the contract. 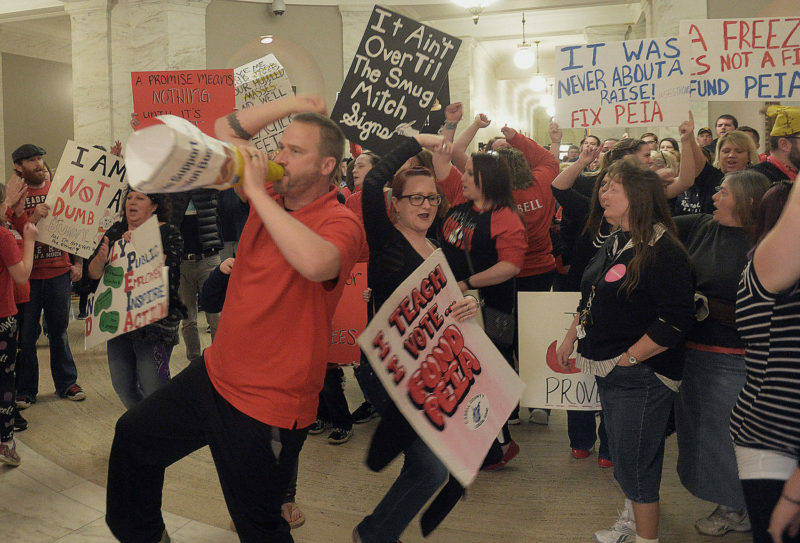 Yesterday, many expected the West Virginia teachers’ strike to end as union leaders and Governor Jim Justice announced a deal to temporarily freeze PEIA health insurance premiums, deductibles, co-pays, and prescription costs. Governor Justice also agreed to create a commission to resolve the long term problems with PEIA. Governor Justice also stated that he would support raising teachers salaries by 5%. Many teachers were upset by the statement as it was unclear if the deal was anything more than empty rhetoric since Justice did not have the votes to pass it in the state legislature. Earlier today, teachers throughout the state voted down the deal proposed by their union leaders and will continue their wildcat strikes tomorrow. Some counties voted down the deal by margins of more than 85%. Many teachers prefer that a long-term fix is passed now by the legislature to address the state’s PEIA health insurance program by increasing taxes on fracking to control skyrocketing out-of-pocket costs. “This is not what we wanted. Like I said, we have sold out and caved into what the legislature and governor wanted,” said AFT member Amber Brumfield on Facebook today. “I’m dropping my 10-year membership. This is NOT representative of your members’ desires!” AFT member Sara Lechner wrote on Facebook. With uncertainty remaining about when teachers will routine to school, teachers’ union leaders have asked the state superintendent to keep schools closed for another two days. Teachers’ union officials remain in talks with state legislators and the governor’s office to see if they can pass a proposal that will satisfy their members. This evening, the State House passed the proposed 5% pay raise. Now, the Senate must take action to do the same. It remains unclear at this point what type of deal would be needed to satisfy the rank and file teachers who are pledging to continue their wildcat strike. It is also unclear if the state’s attorney general will seek an injunction against the union — or even if he would be able to, since the union leaders have actually ordered their workers back to work but the workers have not agreed to return to work. 2 Comments on "Rejecting West Virginia Deal, Over 50 Counties Will Continue Wildcat Strike Tomorrow"
West Virginia teachers have more heart than a pack of grizzly bears! The rest of us can be inspired !